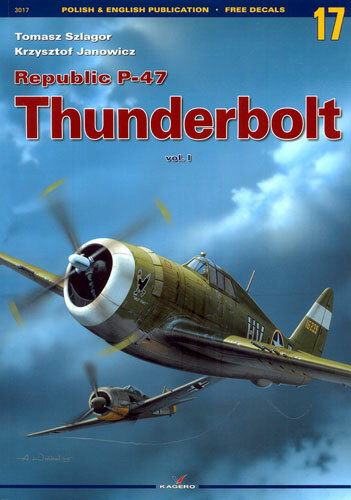 Number 17 in their Monographs series, Kagero's new book is part one of the coverage for the Republic P-47 Thunderbolt. Following the typical Kagero format, it provides details of the development of the P-47 from 1939 and the –A up to 1943 and the –D – and all of this in just 22 pages. What follows in the next 38 pages is a combat history of the type in Europe during 1943. The combat history text is well written and interesting, not the dry "who shot who down on what day" dialogues we have all suffered through in an effort to gain an understanding of how an aircraft type was used during WWII. For those who have not seen a Kagero book before, the left hand column is printed in the Polish language and the right hand one in English. The captions to the photographs as well as the colour artwork receive a similar approach with the Polish language first followed by the English translation. Some of Kagero's books have suffered from quirky translations in the past, happily, this one does not. The book is abundantly illustrated throughout with black and white as well as (five) colour photographs. The photos have been well chosen by Kagero too and many of them will be new to all but the most hard-bitten enthusiast. The book is also illustrated with twenty one full colour profile paintings by Maciej Noszczak. Whilst some of the profiles cover well known machines, there are some obscure ones amongst them and they really do add to the overall depth of the book. · P-47C-5-RE 41-6332 HV-M "Butch" flown by Major Loren McCollom of the 61st Fighter Squadron, 56th Fighter Group, in olive drab over neutral grey camouflage. Modellers would do well to note that no kits of the –C exist on the shelf and you will need to carry out a modification to back date a –D kit to –C standard. · P-47D-5-RE 42-8487 UN-M "Spirit of Atalantic City N.J." flown by Captain Walker "Bud" Mahurin of the 63rd Fighter Squadron 56th Fighter Group, in olive drab over neutral grey camouflage. · P-47D-21-RE 42-25512 LM-Q "Penrod and Sam" flown by Major Robert "Bob" Johnson of the 62nd Fighter Squadron 56th Fighter Group, in overall natural metal finish. 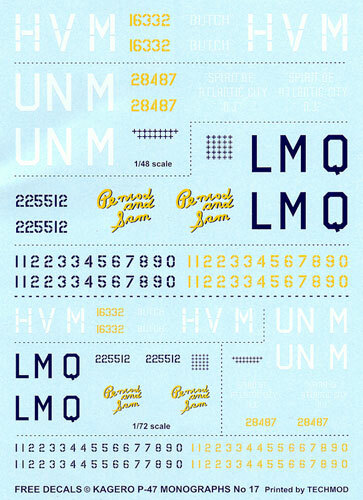 You are also given a set of yellow and a set of black stencil style numbers – great for the spare box! The decals have been printed by Techmod. The decal sheet is packed into a sealed plastic bag that is placed loosely into the pages of the book. There are also a whopping 26 sheets of line drawings. The drawings are in both 1/72 and 1/48 scale. One of the drawings is gate-folded and shows plan views of both a –C and –D in 1/48 scale. What is valuable are the six sheets that show the differences between each of the versions in both written and drawn form. The book is typical of Kagero's Monograph series. It is A4 in size and consists of 115 pages of text printed on glossy paper between cardboard covers. Worth the price from a modeller's perspective? Yes, I think so. The photos are sharp and clear and the line drawings very informative. Kagero's coverage of the P-47s early years is comprehensive in both technical terms and historical terms. I look forward to the next volume!